I really like Thorntons chocolate. 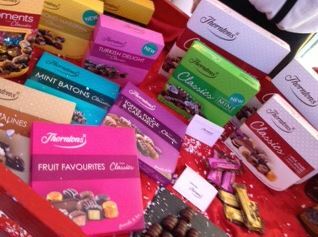 It’s a bit sweet but every so often I get a hankering for sweet chocolate and I always dip in to my Thorntons stash. One of the things I loved from last year was the center piece they made – the hollow chocolate tree with the chocolates around it. YUMMY! Well they had a miniature version which I managed to snag during their Christmas in July event. I just thing they are perfect for individual table settings or on the kits table with the big one on the parents table. Also why not as a trip of trees along a longer table with other decorations around them – then you’ve got part of dessert already laid out. 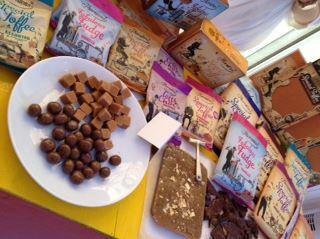 There is also a lovely new range of slabs of toffee. You need a hammer but I absolutely fell in love with the chocolate brownie flavour. Sadly my goodie bag had the tutti frutti in or as you can see but if I was to recommend any flavour, I’m plumping for the chocolate brownie. Go get it if you like toffee because the chocolate is the best. 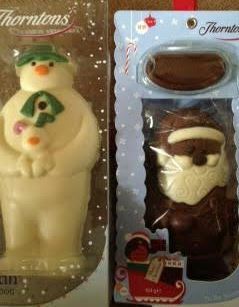 Fantastically there are new flavours of chocolates too like mulled wine which absolutely tastes explosively like mulled wine – BUY SOME and you’ll se but try them *before* the maple. I made the mistake of trying it after and the maple actually blocked some of the mulled wine flavours. Go figure. But the 4 new flavours are delicious. 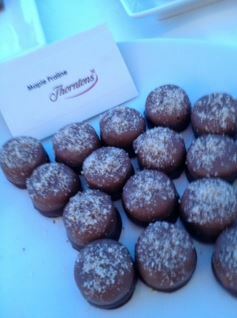 Finally there are these lovely Alcohol truffles. Rum rruffles, brandy truffles, and whisky truffles. 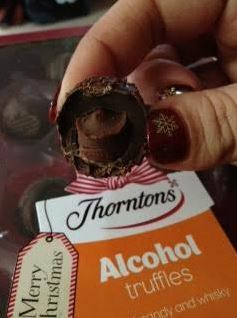 These are OK – not too alcoholic and not too sweet, I think the shell is too think but they are the perfect after dinner chocolates maybe with coffee. I think they aren’t great on their own as the shell is too think but the alcohol flavour, especially in the whisky, is great. 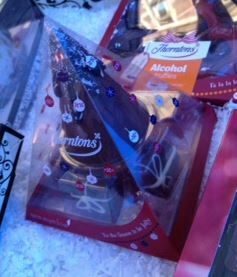 So all in all, Thorntons have a very merry Christmas planned for everyone. Want to make your Christmas merrier? 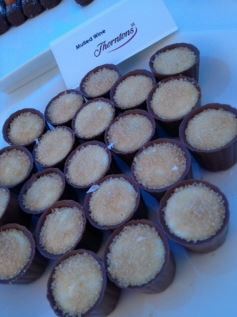 Check the Facebook page for a chance to win a box of the Alcohol Truffles for your next dinner party! Contest closes Dec 16th!